On the question of who would make the better prime minister, she slipped below Mr Abbott for the first time, after falling two points to 39 per cent as Mr Abbott’s support rose two points to 41 per cent. On the first anniversary of the removal of Kevin Rudd as Labor leader and Ms Gillard’s first year as Prime Minister, the government’s primary vote has dropped to a record low for Labor of 30 per cent. The Coalition’s support remains at 46 per cent, with the Greens on a steady 11 per cent. Based on second-preference flows at the last election, the Coalition has maintained its clear election-winning lead over Labor of 55 per cent to 45 per cent. One thing’s for sure, the Australian electorate do not take kindly to being lied to. Ms Gillard yesterday acknowledged that Labor faced “tough times” and was “on the nose” as a political party but she vowed to push on with the carbon tax. She said introducing a carbon tax was like being “made to eat your vegetables” – it wasn’t popular but it was the right thing to do. Take your carbon tax medicine like good little children. You may not like it but it’s the right thing to do..
Gillard: in this country, people elect representatives based on what the people actually want, not based what you think is right. If you want to live in a dictatorship, please move to another country, thanks. There is a danger here though. The report in the and other newspapers, would seem to suggest that the Coalition should reinstate Malcolm Turnbull, the enemy within, as leader of the Opposition. Turnbull’s biggest cheer squad is Labor and they would like nothing better than to see things return to the Malcolm days, when the Coalition was in the political abyss. I have suggested before that one of the carbon-tax protest rallies be held in Turnbull’s electorate outside his electoral office. People seem to be forgetting what he stands for. Clear evidence, a climate signal, that Climate Change affects women more than men. It makes them lie more. Assuming they are female. Many of people in the Labor Party will be doing a lot of hand-wringing about now. They’ve done a deal with the devil (the Greens) and now they’re paying the price. The one hope they’re clinging to is that once the full carbon dioxide tax policy is announced, with compensation, the voters will come back onside. Unfortunately for Labor, the Australian electorate will never forgive the big lie from JuLIAR. Not only that, she ousted a Prime Minister mid-term on the promise of something better – but she’s also failed on that too. Why can’t the Governor on hearing the peoples displeasutre for a carbox tax sack the prime minister and call an election? This whole term is a waste of tax payers money as we voted for change. The people of Australia did not vote for Labour. Majority was Liberal, granted not by much. It was negotiation with the independants that enabled Labour to form Government. This is not what we the people of Australia voted for. Lets stop wasting time and and money and call an election!!!! The Governor General, Ms Quentin Bryce AC, is the mother-in-law of Bill Shorten, a Labor front-bencher, Assistant Treasurer and Minister for Financial Services and Superannuation. She’ll never sack the Prime Minister and call an election! Come on Tony. Keep your head for two more years and we can throw this liar out. 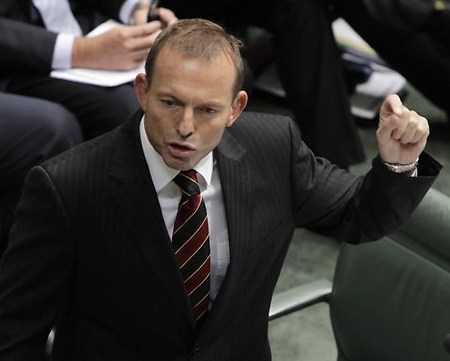 I remarked to a friend some time back , that perhaps the *real* force at work here is to put Tony Abbott in the Lodge. This appears to be the case, but in order to do so requires making labor so unelectable that it makes Mr Abbott look like an oasis in the midst of the political desert. It seems that the real powers behind the throne have decided that we have a Communist PM on the nose, but the other option is a One World Govt advocating rhodes scholar, or if we get turnbull, a One World Govt advocating rhodes scholar. Wow – either way, we get socialism. Note – from spending some time reading , it seems Rhodes always advocated a One World Govt. the UN looks like it will be that. Damned if we do, and damned if we dont. Either ay, we get world wide socialist misery. The electorate is fed up with the Gay Mardi Gras fostering its leftist views on to Australia. We need an election NOW before we are taxed out of existence. I really think that many in the general public are now not even listening to a thing Gillard says , I think people are changing the TV channel at the sight of her or turning off the radio off at the first sound of that all to familiar drone.The anger at the big lie has had a chance to become firmly rooted. I doubt that any carbon tax compensation that she and Garnaut can dream up will turn this tide. And like any dictator they wont budge as they really believe every one loves them and supports them. I wonder when there will be a huge banner of Julia hanging in front of parliment house? Democracy has really going out the door with this goverment. I hope and pray that this proven, rotten liar and utter incompetent extraordinaire, one Madame Jul-liar Gillard keeps on sinking in the polls and this or some other misdeed of hers whether it be at the instance of her boss, temporary, leering, defacto prime minister brown and their equally useless rorting ‘comrades’, including the equally rotten, so called ‘turncoats;’ and that this further turn in the tide, thus triggers a most timely fresh national election! I am sure all right thinking, utterly disgusted, rorted Australian voters will wantonly kick the thick arses of these political ‘has beens’ to kingdom come when this historical point in time occurs!